It is with deep sadness that we must inform you of the passing of Johnathan Evans on July 19. 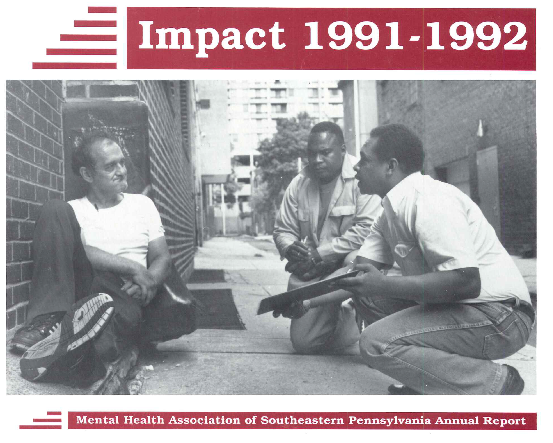 Johnathan was an invaluable and beloved member of the MHASP team since 1990. There is really no way to adequately describe his tireless and determined efforts to bring individuals who are homeless in from the cold. As an outreach advocate at ACCESS West Philly and, before that, at Project OATS, he exemplified extraordinary patience and compassion, and never gave up on anyone. Johnathan was one of the very first in the country to provide peer support in what later became the peer specialist model. His calm, determined, and loving approach helped inform what has become a national movement, and his work and his life have touched thousands. In addition to the work he did on the streets as well as volunteer work with United Way and Mental Health America, Johnathan also helped teach MHASP staff, future social workers/outreach workers/advocates, and schoolchildren about homelessness issues, including the importance of treating individuals with dignity and respect and helping people recognize the strengths in others. 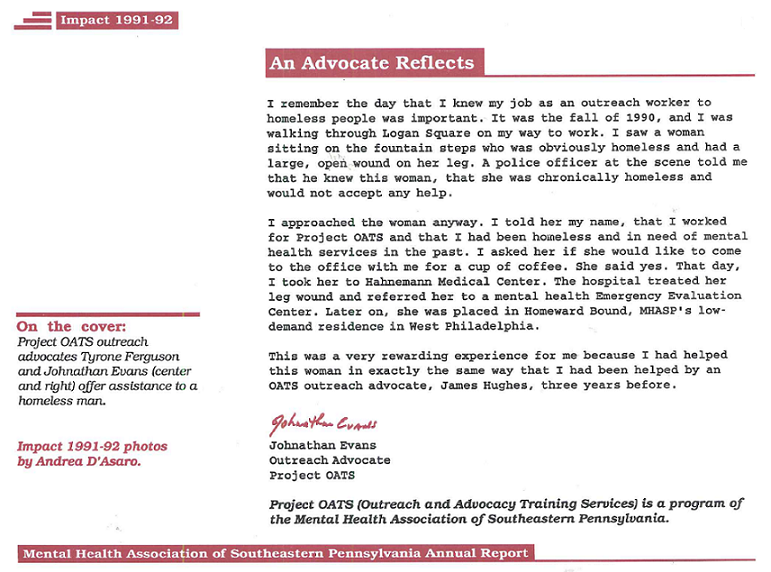 The deserving recipient of MHASP’s very first Outstanding Service Award (in 2001) and the Philadelphia Alliance’s RHD Team Spirit Award (in 2010), Johnathan had been homeless himself until he was encountered by James Hughes, then an outreach worker at MHASP. Johnathan Evans was an inspiring role model and hero to all who knew him. He was an outstanding humanitarian. We shall not look upon his like again. The viewing will be on Monday, July 29, 2013, at 10 a.m. at Wood Funeral Home, 5537-39 West Girard Avenue, Philadelphia. The service will follow at 11 a.m. The interment will be at Fernwood Cemetery.